First I must apologise to any readers who may be vegetarian. This photo is part of my photo a day challenge. 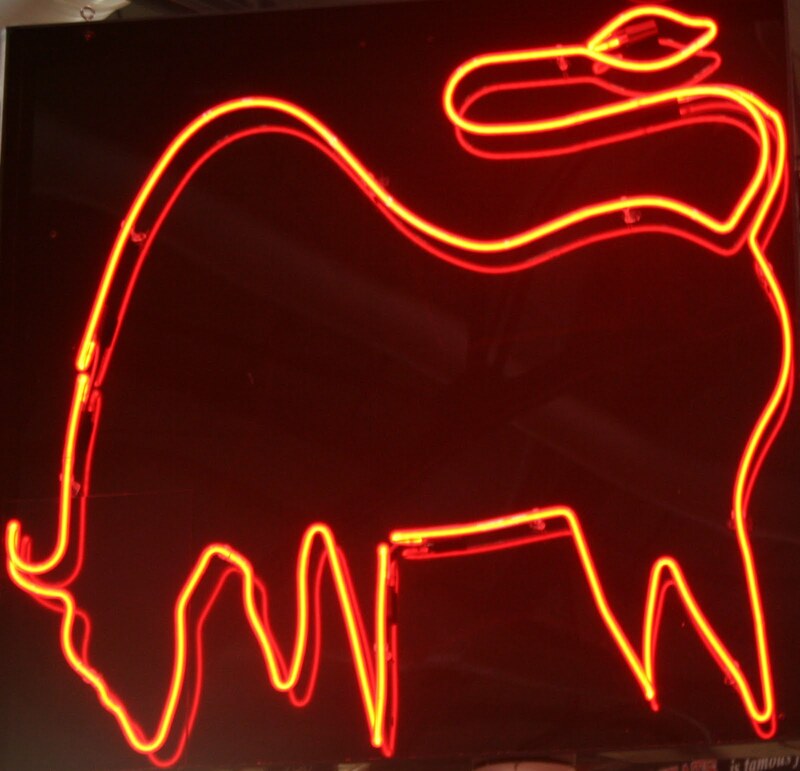 It's a neon sign over a butcher's stall in the St Lawrence Market in Toronto. I took the picture, because to me it "screamed" raw, red meat, as in BBQ'd steak perhaps. For meat lovers especially rare beef lovers, this is a siren's call. I had visions of people hypnotically following that sign to gaze at, even salivate over, the delicious offerings behind the glass display cases!! This sign is a magnet, clamping meat eaters to counters to buy, buy, buy!!!! Now how do we do this with yarn?...or with any commodity other than beef. How do we make our signage a magnet that draws people into our shop or booth or makes people drive up our lane to our farm??? 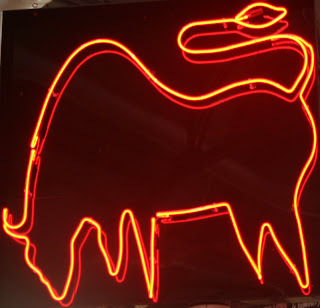 First the butcher's sign has everything a meat eater would love - it is red, it has motion, it's big and tall, above the counter. It is also illuminated against a black background. It's Las Vegas, Texas, cowboys, ranches. They have targeted their customers well. Now you will have to target your customers with a sign that incorporates what you believe your customers want from your company. Is it relaxation, that Zen feeling which comes from natural products and rewarding projects? Is it comraderie from friendly sales people, welcoming knit-alongs, exciting products and projects that are more conversation pieces? Or are you state-of-the-art-style with designer products and high fashion projects? Do you go neon and glitz, wildflowers and woven textures or lots of "happy faces"? You will have to decide and then create a sign or signs that send a clear message to lure patrons to your counter(s).